Remember folks DC Comics has yet to confirm, but Reliable sources say the original Green Lantern will be the character rebooted as gay. The original Green Lantern, Alan Scott, is reportedly the DC Comics character who will be reintroduced as gay. Of course the original Alan Scott, created by Marty Nodell and first written with Bill Finger in 1940, got his Green Lantern powers mystically from a green flame of a magic lamp and he became an original member of the Justice Society Of America. Eventually, Green Lantern would be rebooted in the sixties by DC as a science fiction superhero, Hal Jordan recruited by an alien police force to monitor the galaxy, the character that recently inspired a Hollywood movie. But in the comics, the original Green Lantern would also repeatedly reappear, often as an older man. The character, introduced in 1940, appeared briefly in the first issue of DC’s new series Earth 2. In the DC New 52 books, Alan Scott was reintroduced this month in Earth Two #1, as a young man, and head of GBC Productions. If assumptions are correct, we will learn of Alan Scott’s sexual orientation and his role as a Green Lantern of Earth Two in Earth Two #2, out next month. The New GeekRoundTable Twitter is up! 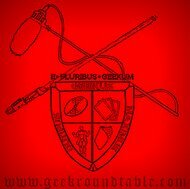 The New GeekRoundTable Facebook is up! Stefan on Is Avatar the best animated series ever?